We know you all fear the word ‘algorithm’ because of what follows an algorithm change. There are always some things changing when algorithm changes – your website traffic drops, your site rankings go down, Instagram feed looks unchronological. Each year, Google makes updates in the search algorithms more than 500 times. Some of these updates are minor while some are major algorithmic updates such as Google Panda and Google Penguin that affects search results in significant ways. While these updates are not in our hands, Google is just improving with these updates. No matter how experienced an SEO professional is, but he/she can’t predict how a particular update will affect your site rankings and traffic. However, SEO experts can help you in adapting to the changes. They can help you understand the effects on rankings and traffic and take corrective measures, if required, to improve SEO. Of late, Google confirmed a major Broad Core Algorithm Update. But even then, Google just suggested keeping generating good content on your sites. Not too comforting, right? You would think you already are doing that! 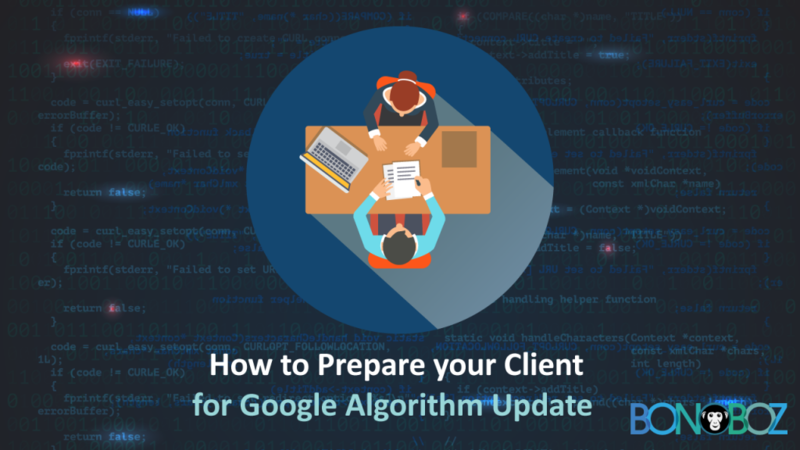 But then how can you prepare your clients for a Google algorithm update? Here are the 4 ways. You not only have to keep a check on Google algorithm updates but also have to keep your clients updated about the same. Whether a specific update affects your client or not, inform them about every update. You must also follow blogs that cover these algorithm updates in detail regularly. Also, some updates affect specific kinds of websites only. So, it’s a good idea to keep a track of SERPs for your main keywords. This will also give an idea about how the rankings of other sites have got affected. SEO comprises of every technique you used in the past too. Communicating even the smallest wins with your client would help them to be ready for any major algorithm update too. You should also make them understand what these updates are about and how do they affect the websites. Keeping them updated on both the challenges and the past wins will ease the panic of these updates. Keeping your clients updated means you yourself have to stay updated and communicate with them early and often. Having your client to tell you about any drops in the rankings or traffics is the worst thing to happen. It gives them a bad impression of you being inattentive. So, you need to be the first one to know and let your client know too. Be quicker in communicating with them anything that Google has updated or changed. This is one of the most important steps. Make sure that your client that every algorithm update will probably have a negative effect on their ranking and traffic while sometimes it might positively affect their site too. Apart from this, teach them how Google works and tell about the past updates and their effects on your other clients. If they too know what really happens during algorithm updates, they might help you rather than getting flustered. Google looks for fresh and relevant content on your site but your site must be visible to Google for that. Keep analyzing your client’s website regularly and make sure that your website is easy to find, index, and navigate. Also, make the website mobile-friendly as it is one of the factors Google considers for rankings. Fix broken links, redirects, canonical issues, tags, etc. to keep the site clean. Making the website user-friendly is as important as making it Google-friendly. Keeping a check on the analytics gives you a quick idea about any drop in the traffic. Pay attention to the page level data too. You can also spot check your rankings on a regular basis. With the analytics, you can keep a tab on in-depth site performance. Having analytics on hand makes you proactive and take corrective measures on the site if needed. Use Google Webmaster Tools to perform site health checks on a regular basis like monthly or quarterly. Webmaster lets you diagnose a number of site technical issues. With its top issues list, support documentation and testing tools, you can get quick assistance if something is wrong with your site. Google Algorithm Updates can be daunting. But keep doing just what Google suggests —create fresh and relevant content, earn backlinks from credible sources, keep your site user-friendly and mobile-friendly. You should then be okay. Make sure you don’t get out of the way for rankings and traffic by keyword stuffing, buying links, spinning content, etc. When you get informed about an upcoming update, inform your client, stay alert, don’t panic and make the necessary adjustments wherever required. Focus on your users and their needs, keep doing the right things and you will surely see the gains in the short time. Previous Previous post: Google Broad Core Algorithm Update: What is it and how to recover?